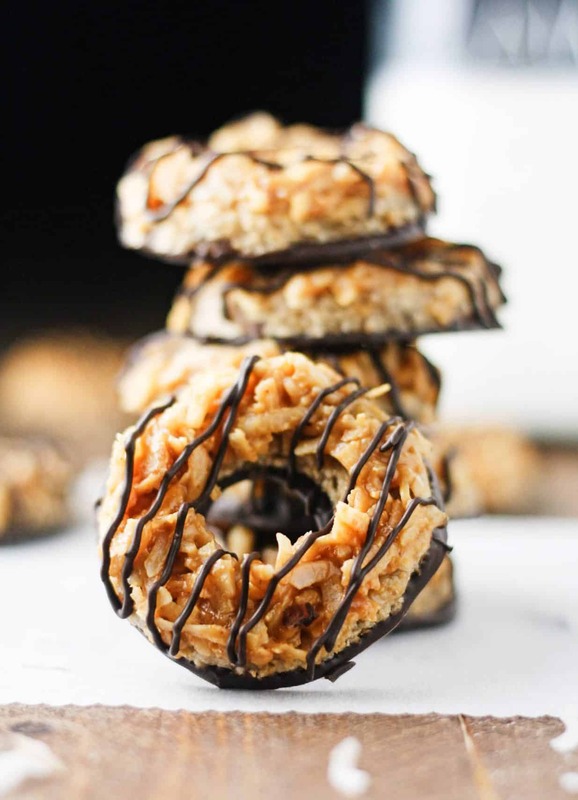 Speaking of amazing food… these No Bake Vegan Samoas will def set you off in the right direction. So, let’s just face the facts for a second. December wasn’t exactly the healthiest month. Actually, if you guys managed to stay on track with the low calorie foods and consistently say “no thanks!” to the truckloads of sugary goods flying at you then I admire you. No, like for realz. Let me in on your secrets. HOW DID YOU DO IT?! Because honestly, while I’d like to sit here and say “oh, Christmas break was a breeze! I don’t even remember what chocolate tastes like it’s been so long.” Well, I would be lying. Even if I were able to somehow magically convince y’all that I wasn’t lying….the scale would clarify that I was lying. The countless holiday group pics with me posing with chocolate stains on my sweaters would tell that I was lying. The candy cane crumbs that are oh so effortlessly decorating my car floor would scream SHE’S LYING. The list could go on; it’s quite…. sad really. But hey, it’s definitely nothing we can’t undo, right? 🙂 That’s why January 2017 we’re starting off strong with the low cals, Yeah! Gym membership in full effect! 8 glasses of water a day! No Bake Vegan Samoas for breakfast! …no really, I’m not kidding. The base for these cookies is SUPER easy to make, includes just 4 simple ingredients and requires NO oven time. I know, it’s like Christmas is happening all over again (and tbh I’m okay with that). Then, for the deliciously sweet coconut topping, we’re cutting back on some of those cals by substituting the traditional caramel sauce for an easy 2 ingredient PB fit & light maple syrup combo (which IMO tastes even better). What you’re left with are soft and chewy, chocolate-y, caramel-y cookies that make this whole new years healthy eating resolution thing a piece of cake (or should I say cookie). In the bowl of a food processor, add the oats, 1/2 cup maple syrup, coconut oil and pitted dates. Pulse until the mixture is fully combined and forms a sticky, dough-like consistency. Transfer the mixture to a flat surface covered with parchment paper and flatten out using a plastic rolling pin until mixture is about 1/4 inch thick (if you are using a wooden rolling pin, be sure to cover in cling wrap first to avoid the mixture sticking). Using a 2 1/2 - 3 inch round cutter, carefully cut out the cookies and then using another smaller round cutter, cut out the centers of the cookies (I found that the opening of a frosting tip was the perfect size for this). Transfer the cookies to a baking sheet lined with parchment paper and refrigerate for 20 minutes or until the cookies are firm. While the cookies are refrigerating, lightly spray a nonstick skillet and gently cook the shredded coconut until slightly toasted. Combine the maple syrup, PB fit powder and water in a bowl and then fold in the coconut. Using a spoon, spread the mixture on each of the cookies. You may have to use your hands to gently press down the mixture to ensure it sticks evenly. Return to refrigerator for 10 minutes. Melt the chocolate chips in a microwave safe bowl and carefully dip the bottom of each cookie in the melted chocolate. Drizzle the remaining chocolate over the tops of the cookies and refrigerate for an additional 10 minutes or until chocolate has solidified. Enjoy! *to keep this recipe gluten free, opt for gluten free old fashioned oats. **be sure to use vegan chocolate chips if you wish the make this recipe vegan. Wow, these are gorgeous - and vegan / no bake to boot? You're brilliant.